Davos homeowners are hiking prices on Airbnb to capture the fortunes of the elite attending the World Economic Forum that starts next week, reports the Financial Times. “The few thousand industry leaders, politicians, celebrities and hangers-on about to embark on their annual pilgrimage to the Swiss Alps seek to block book the best rooms and houses in the most secure locations — but even the most modest come at a cost,” it says. For residents of Davos, the new arrivals are a goldmine, with one room commanding the equivalent of an annual year in rent, points out the FT.
“Browsing apartment rental portal Airbnb a fortnight out from the conference, it is clear that locals are cashing in. Across the handful of listings remaining, the average nightly price is a shade under £2,500. “A single bedroom, into which three beds have been squeezed, is the most affordable of the set, at £795 a night. A three-bedroom apartment, listed at £1,911 a night during the dates of WEF, is renting for an eighth of that price a week later,” continues the FT.
For hotels, there is an “unspoken rule which is [you can charge up to] 20% on top of the top season. Under the table I have no idea whether there is a limit on it”, according to Dagmar Weber, director of residences at the Hard Rock Hotel Davos. It seems the “unspoken rule” often goes unobserved: a double room at the Hotel Derby for the three nights of the conference was advertised for €7,484 (on January 4); the same period the next week cost €237 – a reduction of almost 97%. Other than the dates, the only discernible difference between the offerings is that the former includes breakfast, says the publication. The conference may animate Davos, but the town is not deserted outside of January, it says. “In part that may be thanks to the Lex Koller and Lex Weber laws that restrict the number of second homes which foreigners can purchase and limit the number of second homes that can be built,” explains the FT.
“Most of the people who live here do so year-round. 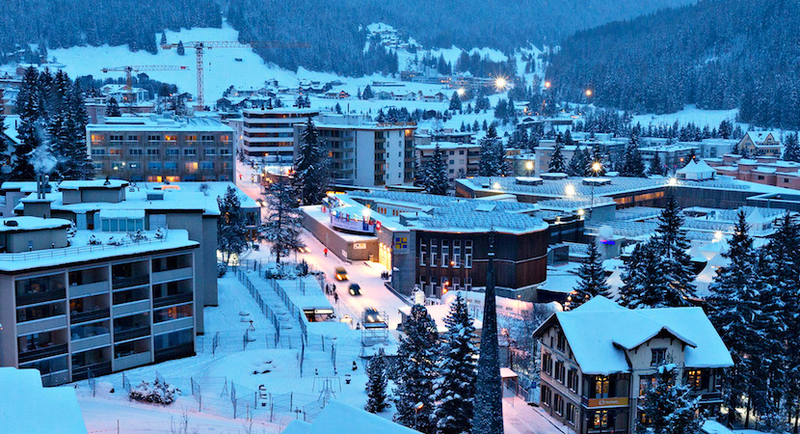 Beyond property regulation, Davos has tuberculosis to thank for its perennial buzz. In 1860, the town harboured a modest population of around 1,500. That number grew almost sixfold in the following half-century as TB — the ‘great white plague’ — ravaged Europe, becoming the cause of an estimated 25% of all deaths on the continent at its mid-19th century peak. Property is more affordable than in Switzerland’s picturesque village resorts such as Verbier, St Moritz or Gstaad. “It’s a mid-market Swiss resort,” the FT quotes Jeremy Rollason, head of Savills’ ski department, as saying. Mid-market in the Swiss Alps translates as over €10,000 for a square metre of prime property, according to Savills. “There is strong domestic demand in Switzerland now,” says Rollason. “The Swiss have long regarded property as a liability, not an asset, but that has changed in the last five years: partly because of Lex Weber — they realise there is an opportunity to buy a supply-limited asset — and partly because there’s a negative interest rate [currently -0.75%]. They’ve got to put their money somewhere,” he adds. A two-bedroom apartment in a Belle Époque former hotel is on the market for SFr890,000 ($906,000) with Cimag, according to FT research. A three-bedroom apartment at the Hard Rock Hotel — which includes on its staff a “vibe manager” — is on sale for SFr1.86m, says the pink paper. “Buyers can recoup some costs during the WEF through the hotel’s rental scheme. A seven-bedroom chalet, in the hills overlooking Davos, is on the market for SFr4.7m with Engel & Völkers,” it says. “Although it is a pricey option, renting it to a flush set of dignitaries for one week in January should more than cover annual costs,” adds the FT.